– “History of Apollo, PA 1816-1916: The Year of a Hundred Years” by T.J. Henry, M.D. "Moon soil" from Moon Township, 1969. Established in 1816, the town of Warren, located northeast of Pittsburgh on the banks of the Kiskiminetas River, purportedly got its original name from a farm in the area called “Warren’s sleeping ground.” Unfortunately, Pennsylvania already had a town called Warren, and so Warren number two disappeared and became the borough of Apollo in 1848. Early industry in the region centered on the abundant salt in the area and a close proximity to the Pennsylvania canal. Later, iron and steel mills moved into the region and became the dominant employers of the town, none more so than the Apollo Steel Company. All of this, however, has little to do with the space race of the 1960s. Apollo happened to be the only place in the world named Apollo at the time of the Apollo Moon missions, and the town took great pride in this fact. 10th Anniversary patch from Apollo Moon celebration, 1979. 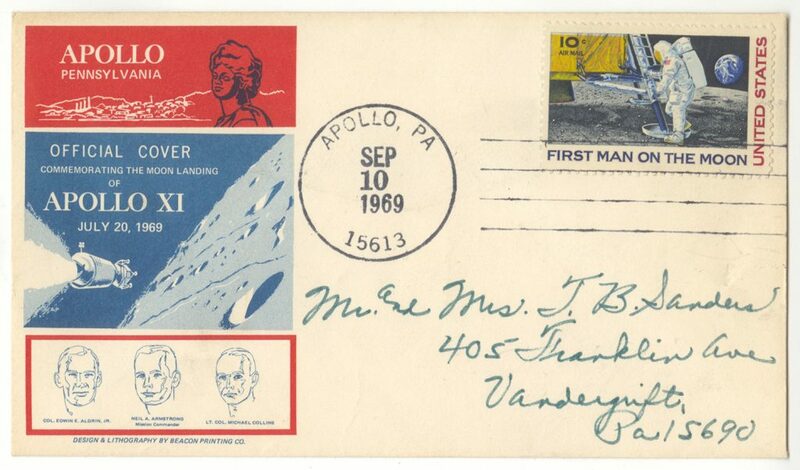 "First Man on the Moon" commemorative stamp, 1969. When Neil Armstrong became the first human to walk on the Moon during the Apollo 11 mission, it caused a frenzy of excitement in this small community in Armstrong County. Townspeople held a large parade on July 21, special commemorative envelopes were made, the town sponsored a special commemorative stamp ceremony, and the astronauts were named honorary citizens of the town. But the most unique celebration happened the day of the Moon landing. Members of the Apollo Fire Department traveled to Moon Township, north of Pittsburgh, dressed as astronauts, planted a flag on “Moon soil,” and brought a sample of soil back to Apollo. Many of these celebrations continued into recent years. As the 50th anniversary of the Moon landing approaches, I think the only thing to be done is for that same fire department to make a trek to Mars, Pa. and bring back Martian soil to be displayed proudly next to its lunar mate. 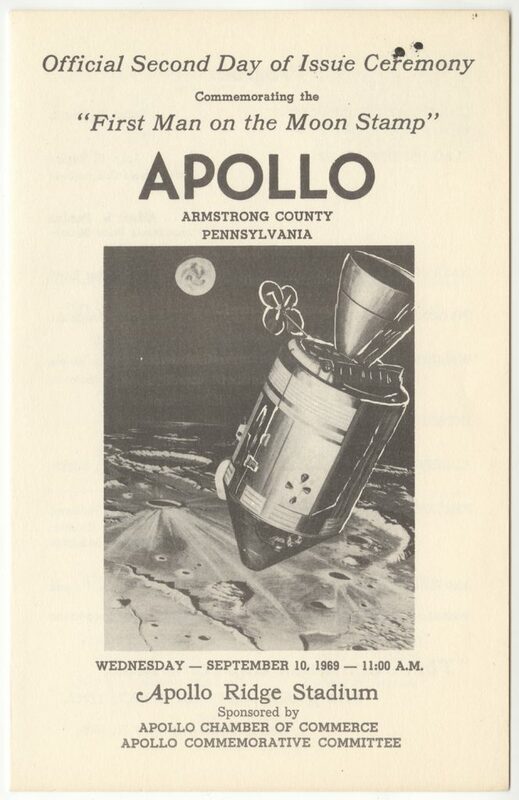 Program from "First Man on the Moon" launch, 1969. 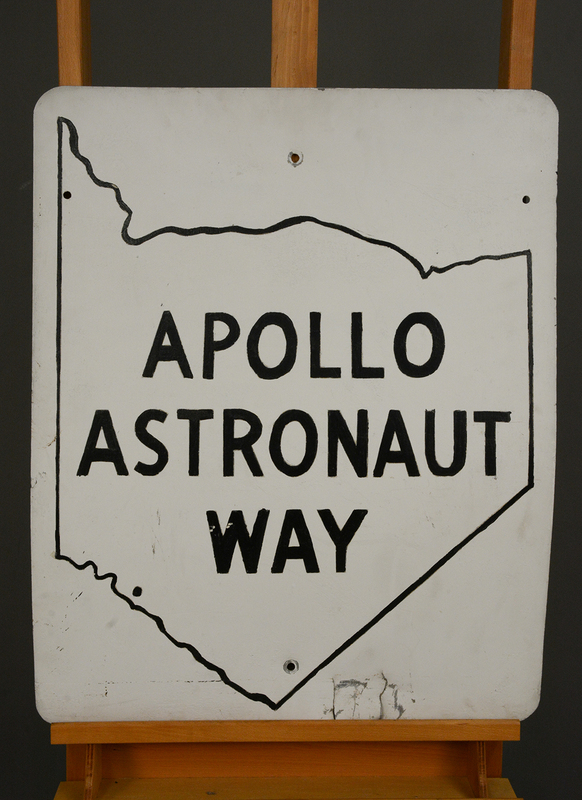 Apollo Astronaut Way road sign, 1970. On July 27, 1970 the town of Apollo held an official ribbon cutting ceremony to mark the opening of Apollo Astronaut Way. The words are contained in an outline of Armstrong County. 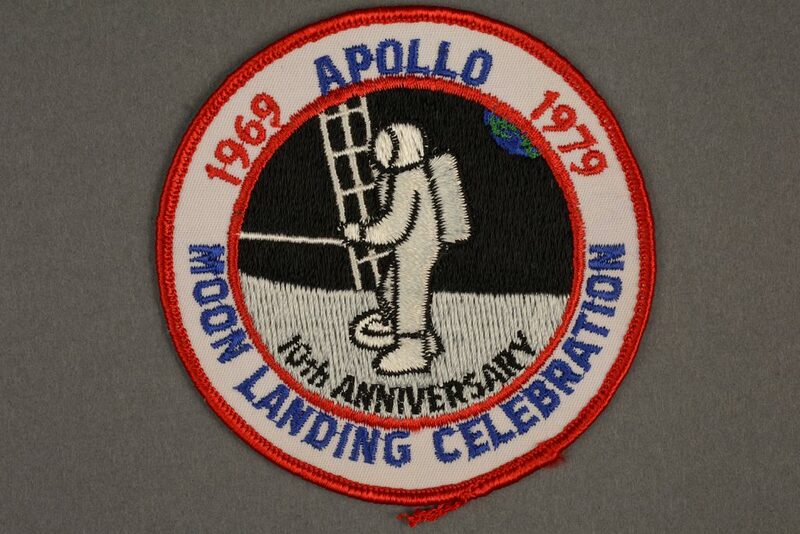 Courtesy of the Apollo Area Historical Society. 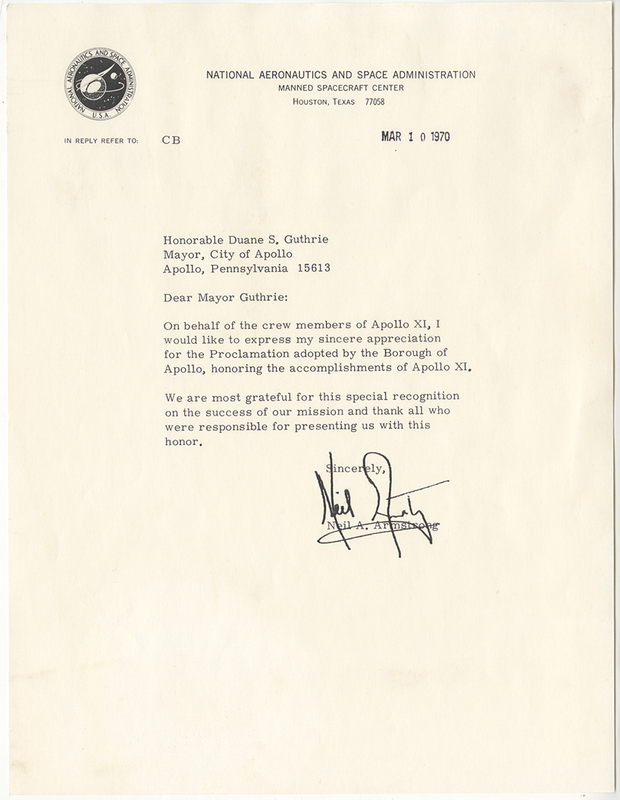 Neil Armstrong letter thanking the mayor of Apollo for Apollo 11 Proclamation, 1970. 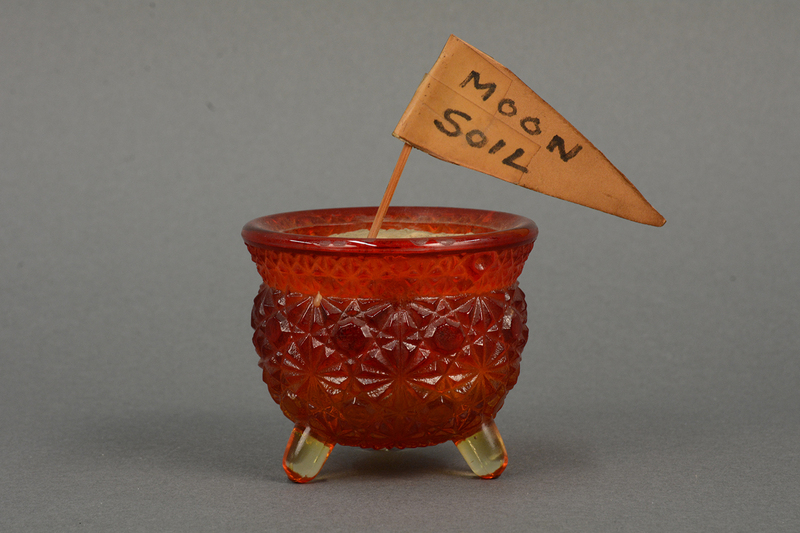 Make sure to check out Western Pennsylvania’s own “moon soil” on display in Destination Moon: The Apollo 11 Mission, open through Feb. 18, 2019. Emily Ruby is a curator at the Heinz History Center.